Discover all that Bronshoj has to offer with Brønshøj Hotel as a base. 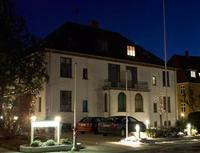 The Brønshøj Hotel boasts a convenient location with modern amenities in every guestroom and superb service. Each guestroom has daily newspaper, television. Guests staying at this Bronshoj accommodation can enjoy a wide range of hotel facilities such as pets allowed. Modern comfort and convenience are seamlessly combined to ensure the guests' satisfaction. For your reservation at the Brønshøj Hotel Bronshoj, please choose your period of stay and fill out our secure online booking form.